I’ve always loved banana bread. My mom used to always make the most amazing buttery banana bread that oozed with dark chocolate and it’s one of my favourite tastes. This is my grain free version, it’s crumbly, oozing with gooey chocolate chips and bursting with mushy banana flavour. 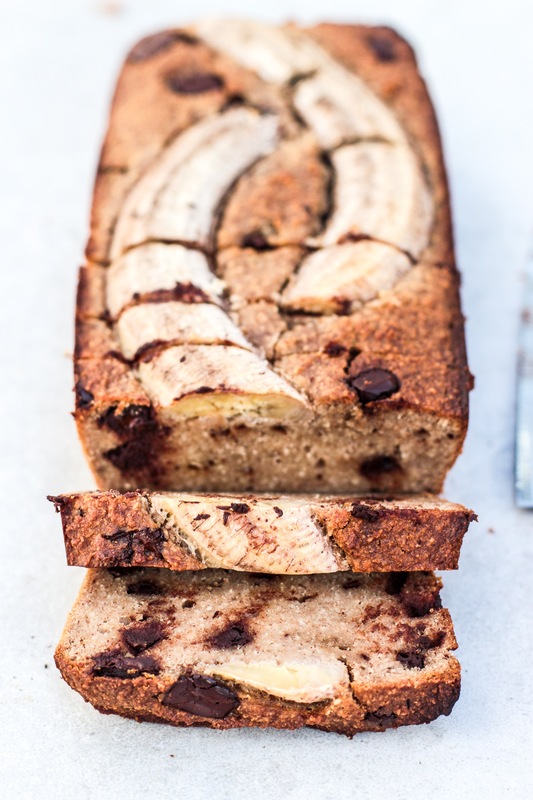 If you like it, give my Blueberry Banana Bread a go. Combine the ground almonds, baking powder and cinnamon in a large bowl. Add 3 bananas to a blender with the vanilla extract, maple syrup melted coconut oil and 100ml of chickpea water from the tin (keep the chickpeas for something else). Blend until smooth. Add the wet mixture to the dry ingredients and mix well. Chop the chocolate in to hunks and mix them in. Spread the mixture out into a 1lb loaf tin. If you want to, cut another banana in half lengthways and press it into the mixture. Bake for about 65 minutes until golden brown and a knife inserted into the middle comes out clean. Let it cool completely on a wire rack before removing from the tin and slicing. Hi, I love your blog! What could I sub the almond flour for due to nut allergies? Can you substitute the almond flour with coconut flour? I have been baking with almond flour a lot lately but I don’t really like the taste. I much prefer coconut flour so wondering if I can substitute the almond for coconut? You could substitute with coconut flour but you would have to make a lot of adjustments as they are completely different consistencies! I’d start off using some of each and then experiments a bit to get the right texture! What are the measurements in grams for the almond flour and coconut oil? I always use cups so I don’t know but there’s a great app called kitchen pro for conversions! Almond flour? Is this the same as Ground Almonds? The only difference is that almond flour is more finely ground but you can always use ground almonds in place of it! Hope you enjoy! My dad got almonds so I used a hammer to grind them up! Just wondering as this is an Irish website why are the measurements in American cup measurements? Love your blog – can I freeze this?